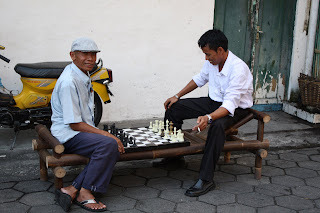 Bali has been entertaining for centuries a colorful imaginary for apprentice pirates, bedroom travelers and other daydreamer adventurers, and frankly speaking it will be difficult to give justice to such a beautiful and welcoming place on the planet in a couple of sentences. But let me try anyway. 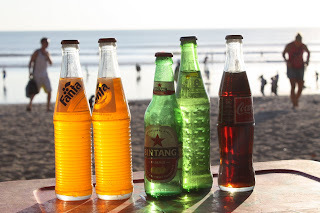 First of all it is an island stuck between the big Lombok and the bigger Java along the equator, and since the early days of the Javanese empire its inhabitants have developed a privilege relationship with the surrounding water. The interesting thing is that Bali has no major waterways, and apart from the seaside temple of Tanah Lot, the natural borders are not yet used by the tourism industry, leaving visitors to explore the island as it used to be and as it should be : by foot walking along the beach. 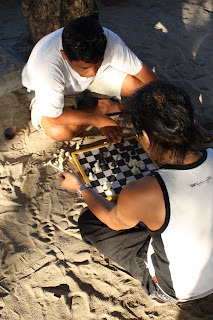 One might add that the Kuta resort is a scar on the face of Balinese culture, but I would argue the opposite. Moving from an agriculture base society three decades ago to advocating its own culture, the island managed to stay intact yet changing in its interaction with the world. 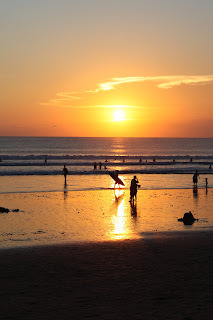 Of course, (mass) tourism has a major impact on the island, but Bali managed to deal with it on its own way : by parking most of the visitors in a small place, down south, away from the most interesting places of the island. The destination is most well known for being a surfer paradise, although I would say that the island proposes the most delightful experiences in Asia only if one can escape from the resort and lost self around for new adventures. 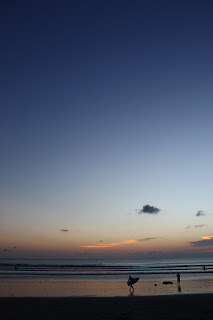 In a shape of a large champagne cocktail glass, Bali offers a large playground for new and interesting ways of vacationing (Dance, Music, Painting, Architecture, Natural Park, Diving Sites, Volcanoes and Food). It’s up to you to drink that till you drop. This quiet place at the back of a greeny garden and with a olympic swimming pool is the right spot for any backpacker who is concious of it own confort. Nice pick at a reasonable pricec for the location. This lean hostel seems to have a lot of press and is heavyly loaded with surfers, in case if you have to stay in Legian or Kuta. Gado Gado Restaurant is one of the most exclusive places in Bali, by its location, right on the beach dinning, by its style's cuisine and by the high service. It's the a good spot to enjoy a late breakfast, a nice lunch by the sea, a few drinks while watching the sunset or a romantic candlelit dinner under the stars on the island of the gods. This french bakery offers french pastry and breakfast to the local and travel community at rather western expensive price. Too bad that food did n not match the bill expectation. 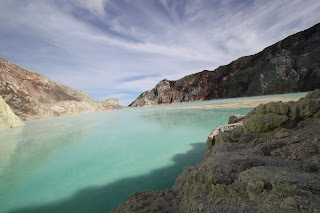 I was not prepared to collect a story like that during my trip to Indonesia, but I am glad I walk with Suleiman the miner, on the way down to the turquoise lake. 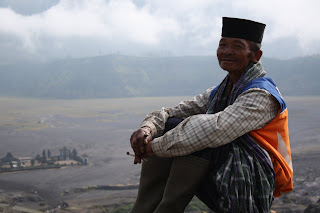 After our Mont Bromo expedition, we were waiting for the local bus to pick us up to go to Bali and its well deserved beaches, when the tour operator started talking about the plateau. He did warn us about the beautifulness of the place but did not mention at all the collective effort (or pain) shared by the miners in the dangerous sulfuric habitat. He just said that it was the most beautiful place in the region and we could walk on the same path as the miners. He also mentioned that they were doing a hard work and he would not want to do this type of job himself. Well … there are so many jobs I don’t want to do myself, I though it was one of them … but I never imagine to be so close to the (re)action of the pain of work that I saw that day. 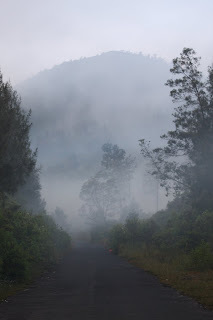 The next morning, we started at the end of a peaceful misty road, early in the morning as usual in this grandiose land of the majestic actives volcanoes. It seems that people in East Java enjoy waking up at 3 AM to start their day at 5 AM. Not sure why they are so set on the Japanese time zone … but anyway our driver left us at 6ish at the feet of the trail and wished us a good luck that should had been taken more carefully. The pleasant walk across the forest only lasted a merely three minutes, and the trail changed suddenly into an abrupt trek that I can only imagine Nepalese would delight themselves over a cup of tea early in the morning. I was walking at the best of my capacities crossing sporadically groups of miners, with flip flops on their feet and empty baskets on their shoulder. They usually asked for a cigarette or small cash in exchange of a picture or a smile. My poor physical condition did not allow me to follow their steps. They never waited for me and jumped right back to their early exercise, living me behind fighting with the extra pounds that I carry around my belly for quite some months now. Laughs from around the corner gave me some hope that the end of my morning exercice was coming to an end soon, but the small hut was in fact a stop over on the way down the hill for carriers to weight their loads. Carriers were making a stop and exchanged their loads, smoking a cigarette or discussing over a splash of water. 75 kilos on average was what they were caring on their shoulder. More or less my weight (if only these extra pounds …) and half my size. 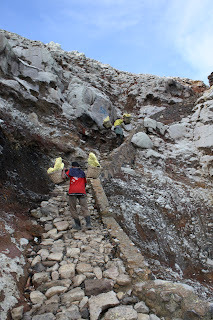 The smell of the yellow sulfuric stones was everywhere along the trail, and it was not long before we could finally see the top of mountain. Like magic, trees move out of the way to let me contemplate a large greenish lake at the bottom of a smoky yellow crater. The early morning light was reflecting on the surface of the lake as well as dancing trough the smoky cloud coming from the crater. The scenery was wild and impressive. Suleiman was singing along the way to his destination when I met him. He stopped over and started engaging the conversation, showing me his atrophied shoulder muscle, his scar from a previous day way back in time and explaining me his daily routine: three back and forth, starting at 6 in the morning and finishing at dark, even if it rains. On top of the volcano he pulled me on the side and explained me what everyone was doing. The yellow moving dots on the trail were in reality the carriers who pull out of the mine over 70 kilos each time of raw sulfuric mineral. 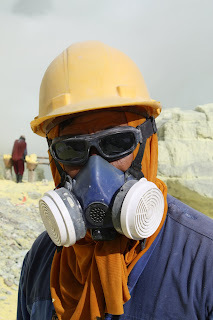 You also have the digger who breaks the mineral in the sulfuric mist with his hand and a piece of cloth in his mouth for only protection against the killer fume. And you have the boss who watches everyone. That was Suleiman who showed me the best place to watch the smoke coming out from the bottom of the volcano, who lead the way on the path down and who translated the joked about this crazy foreigners who want to see the entrance of Hell. Right at the bottom of the volcano, close to the green lake, looking at the yellow mountain was dangerous yet fascination for me. I could not stop myself shooting pictures trying to get closer and closer to the fuming action. 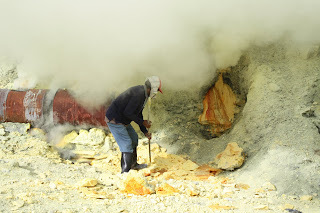 The sulfuric mist which sometimes was eating alive all human form and sometime spilling them out, had golden reflection on the lake and made me thing of a live animal with which the miners were fighting against. During a few minutes, the lake opened itself under my eyes, delivering a loud and sunny panoramic view, melting acidic greens, yellows and blues all together. My fascination for the aesthetic of the scene was at its maximum, I could not let go my camera. Why is it that the most dangerous jobs have to be in the most beautiful places? The walk back was even more painful, and I could measure the exact amount pain the place was taking away from them for each step forward they were making. The volcano was echoing all the swearing that the Suleimans of the plateau were throwing at each other to give themselves strength and courage, and also a sense of purpose why they were doing all of these for a merely U$20 a day. 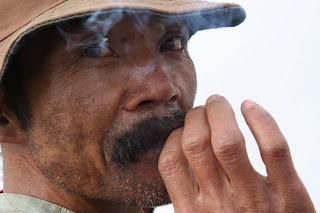 His name is Suleiman from Indonesia, a sulfur miner at Ijen Plateau. They are hundred of thousand like him across the planet. His name could have been Pedro, a silver miner at Potosi in Bolivia, or John, a daemon miner in Liberia or even Silva, a gold miner in Brazil. I am glad I spend some time with one of them, on the way down to the yellow lake. Don't even think you can find it by yourself at the end of the road, but this strange hostel in a tiny village offers a swimming pool, all you can drink coffee and small beds for you to lie over before waking up for a tour to the plateau or hot springs. The dinner there was average and shared with all the wild insects surrending the unique light in the valley. Should be the best around ... although we arrived late at night and strated early in the morning. 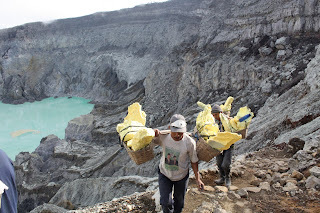 Mitchell Kanashkevich is a photo-journalist, and made few years ago a photo reportage on the miners of the Ijen Plateau. His webiste and photo albums are remarkably well illustrated with fantastic stories about the plateau, and other places in Asia. Somehow he is redefining the very nostalgic notion of journalism. Thanks to J., who pointed me out another virtual place, here another blog story about the Plateau. Ulet Ifansasti’s blog entry depicts the poor working conditions the mine. According to Softpedia , it's the world's largest Acid Lake of the planet, and probably one of the most difficult to work at: "In 1976, 50 people were surprised inside the crater by an enormous bubble of sulfuric dioxide, which, after raising the surface of the lake, killed 11 of them by asphyxiation. 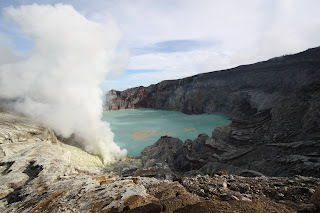 The local people said it was the sacrifice asked by the volcano for offering its riches. " A small step for a man, but a giant leap (out of my bed) for my kind of mind. It all started extremely early in the morning, around 3:30 AM or so in a cold and freezing night. The extraction from my cold and humid bed was in fact a salvation on the road of sickness. 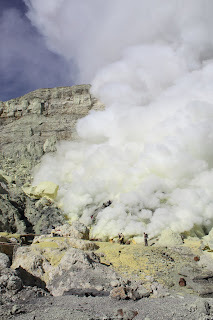 I don’t know why all beds at the lodge were all humid (dryer might have broken) but it was the consistent complain that I heard in our 4*4 road tour to the over expected Mont Bromo, the brochure highlight volcano cumulating at 2,392m above sea level. 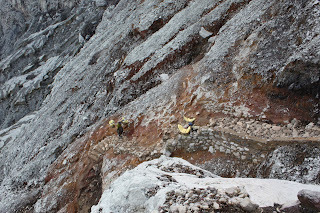 What we discovered was in fact a sea of loud tourist concentrated on top of the Mount Penanjakan (2770m) our first stop of the program, the other volcano mountain from which you can observe the massive Tengger Caldera. We were hundred of tourists squeezed on top of the observatory to see the hypothetical paper guarantied sunrise. It did not really matter in fact that we only witness that morning the sunrise of mass human enthusiasm over a cloudy sky, because what we encounter later on was a fantastic experience with magazine pictures on our second and last stop. After our cloudy sunrise, we found our way back to our 4*4 in the middle of hundred of them and drove down the volcanic craters. 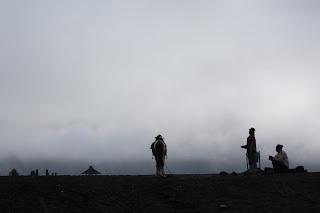 The car dropped us 3-km away from the foot of Mount Bromo, leaving us to the ultimate entertaining experience of walking among horses, clouds and loud tourists. From the Hindu temple a steep path of 250 recently arranged steps leads to the edge of the crater and a precarious meter-wide ledge from where to gaze into the volcano, leading finally to one of the most amazing landscape in East Java. From atop of the Mont Bromo, one can observe the inside of the caldera, rightly named the Laut Pasir (Sea of Sand), covered with fine dark grey volcanic sand and the overall effect is mind blowing, when compared to the lush green valleys around, the cloudy white blanket surrounding the friendly volcanoes and the raw and unhealthy white sulphurous smoke coming out of the Mont Bromo. The giant Hindu temple at the entrance of the moon landscape at the feet of Mt. 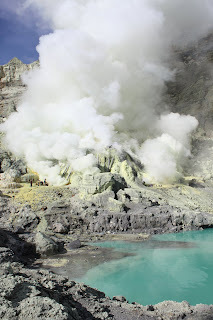 Bromo looks ridiculously fragile in comparison to the fearful natural force that radiates from the perfectly 10 km round caldera. Nature imposed its respect and no one should be foolish enough to think differently. 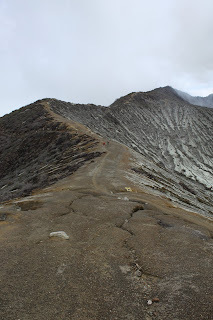 This place is suposed to be the closest place around for an early departure to see sunrise on Mt Bromo. I wouold rather try to avoid this pseudo-Bavarian hotel with cold shower and humid bed. Rather expensive but when you almost are the only place around why bother. 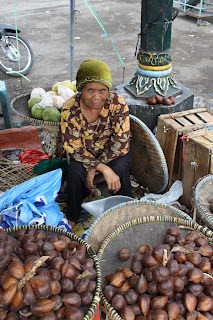 Mr. Scam is living in Yogyakarta (pronounced Djodja) and I meet him everyday during my stay in East Java. From the simple fruit seller on the street to the most respected university professor, Djodja has been a continuation of scamming exercises. Not a single person did not talked to me about the famous Batik Center. It almost that the entire city has been going to Scam-school and has a consistent message: Go-To-Batik-Center. It’s unfortunate that a city with such a beautiful and interesting arts, architectures, culture and food could not be enjoyed peacefully. By resentfully trying to scam foreigners & local travelers, a handful, yet very well organized inhabitants, is forging an irreversible reputation and the city will soon be unfortunately avoided. I do understand that the balance of mass and upcoming tourism within a developing world is always difficult to reach, annihilating any government incentives if any had happen, but for sure this opportunistic short-term mindset, although easily understandable, should be discouraged for the sake of the Javanese. “How” is the million Rupiahs question (equivalent to US$100 for those who wants to know). 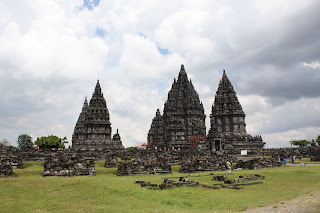 Now, if you dare explore the outgoing charms of the region, you will encounter the delights of Prambanan, a collection of massive Hindu temples built by the 10th century Mataram Kingdom, rulers of central Java and defeaters of the Sailendra Dynasty. 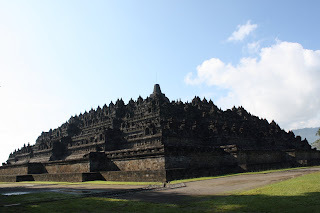 Although this compilation of Hindu temples is stupendous and now suspended (an earthquake in May 2006 ravaged the majority of the site), this is nothing compare to another architectural jewel one hour away from the capital of East Java. 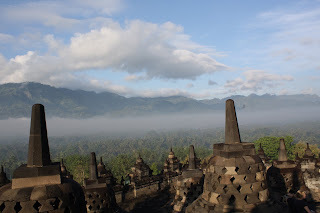 Borobudur is considered to be the world largest Buddhist complex discovered today. The monument comprises six square platforms topped by three circular platforms, and is decorated with thousands relief panels and hundred Buddha statues. 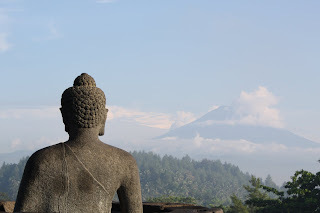 It seems that Borobudur was abandoned following the fourteenth century decline of Buddhist and Hindu kingdoms in Java. The first archaeological study of the site was initiated in 1814 by Sir Stamford Raffles, founder of Singapore. First restored in 1907, the monument suffered from neglect and war and was once more in effect rebuilt in the 1970s under the guidance of UNESCO, who designated Borobudur as a World Heritage Site. The best time to visit the place is early in the morning. The early wake up is worth the extra effort to admire one of the most beautiful scenery on top of the most remarkable Hindu temple. The site is open to the public from 6 AM to 5 PM. However, the Manohara Hotel is apparently, according to some source, the only hotel that can provide a truly sunrise tour. But as you know already this is not something I can confirm since Mr. Scam has also been seen walking around the hotel. This Bed & Breakfast / Hostel is a good place to hang out in the North side of the main backpacker area of Yogya. With vast,quiet and spacious room you will be able to enjoy the good Western & Indonesian food from the kitchen, the refreshing swimming pool and smiling staff. As loong as you can bear the early morning next door church and early airplanes. 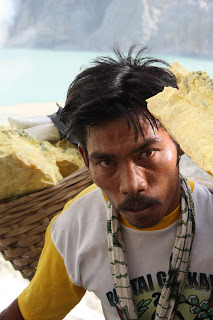 Did I mentioned that Bladok proposes the best Banana Pankake in the North of equator? Pass the shop at the entrance and pop your head in the back of the warehouse to watch ow batik are been made. The friendly staff take you arouond and explain the different processes involve ini this hand made and therefore unique fabric. From the same above owner, the Gallery is in fact a furniture exhibition center that can ship almost good teak pieces anywhere in the world. Lana Gallery displays contemporary art from artists of Yogya's Fine Arts school at Western price for Western clients.